IN a city passionate about the environment and technology, commuters are using their smartphones to check in at a popular social networking service to help keep a critter threatened by climate change from checking out. Foursquare, a rapidly growing social network, lets people use their mobile phones to announce their location to friends. When they arrive at a restaurant, bar or another site, they “check in” and can broadcast their whereabouts through other social networking sites like Facebook and Twitter. The Earthjustice campaign appears to be among the first to let people check in at a physical billboard, a tactic that has proved successful for the firm and could be attractive to other advertisers, according to industry analysts and Foursquare executives. Earthjustice’s foray in location-based fund-raising began after the group was offered free ad space to run public service announcements at several Bay Area Rapid Transit stations. Earthjustice persuaded one of its donors in the Bay Area, whom Mr. Wan described as “very progressive” but who wished to remain anonymous, to pledge $50,000 toward the experimental campaign. Human Ideas, a Minneapolis firm, created the wall-size ad featuring the pika, which many biologists consider the animal most at risk in the continental United States from global warming. 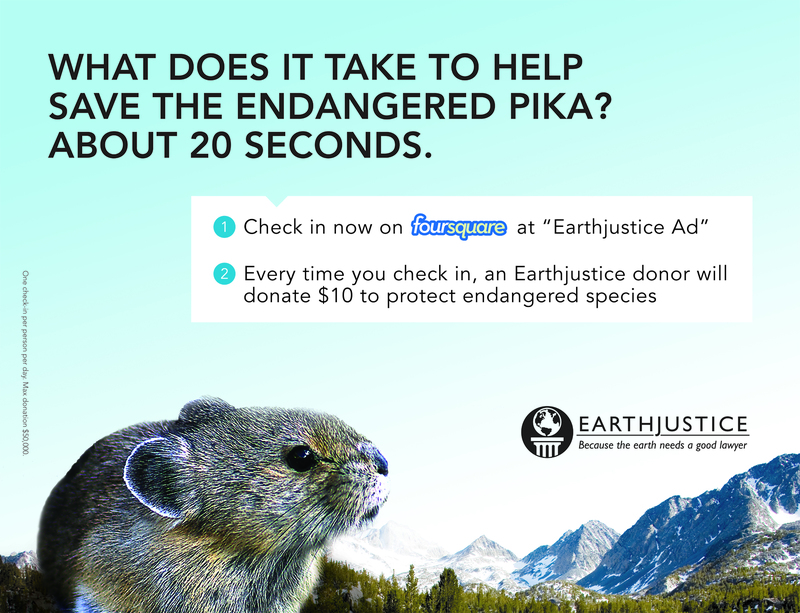 Earthjustice represents the Center for Biological Diversity, an environmental group that is fighting to place the pika on state and federal endangered species lists. The pint-size mammal lives mostly in mountainous areas in the western United States and Canada, and even a small spike in its body temperature is fatal. As temperatures have risen, pika populations have vanished from lower elevations, while other populations have remained stable. In February, federal officials declined to give endangered species status to the pika. Commuters have checked in at the ads more than 5,700 times, meeting Earthjustice’s $50,000 fund-raising goal. Many of those who use Foursquare automatically post their Earthjustice check-ins on their Twitter and Facebook pages, further spreading the group’s message.